India is a famous country where thousands of tourists visit every year. Here we discuss the list of most popular world heritage sites in India. Red Fort was the fortified palace of Shahjahanabad, the new capital of the fifth Mughal emperor of India, Shah Jahan (1628-1658). Its name is due to the red color of the sandstone with which its imposing walls were built. In its vicinity stands another older fortress, Salimgarh, which was built by Islam Shah Suri in 1546. The two buildings form the Red Fort Complex . The private rooms consist of a series of pavilions arranged in a row and linked by a channel known by the name Nahr-i-Bihisht , Arroyo del Paraiso. It is considered that the Red Fort is a representative sample of the heyday of the creativity of Mughal art, which in times of Emperor Shah Jahan reached a greater degree of refinement. The palace floor is based on Islamic prototypes, but each of the pavilions shows typical architectural elements of the Mughal buildings, where you can see the fusion of Persian, Timur and Hindu traditions. The innovative planning and architectural style of the Red Fort as well as the design of its gardens, exerted a considerable influence on the design of buildings and gardens subsequently carried out in Rajasthan , Delhi , Agra and other places. Built at the beginning of the 18th century, the Jantar Mantar in Jaipur is an astronomical observatory composed of some twenty masonry instruments that were innovative in their time, both architecturally and technically. Destined to astronomical observations with the naked eye, they involve several architectural and instrumental innovations. It is the most significant, most complete and best preserved set of ancient observatories in India . 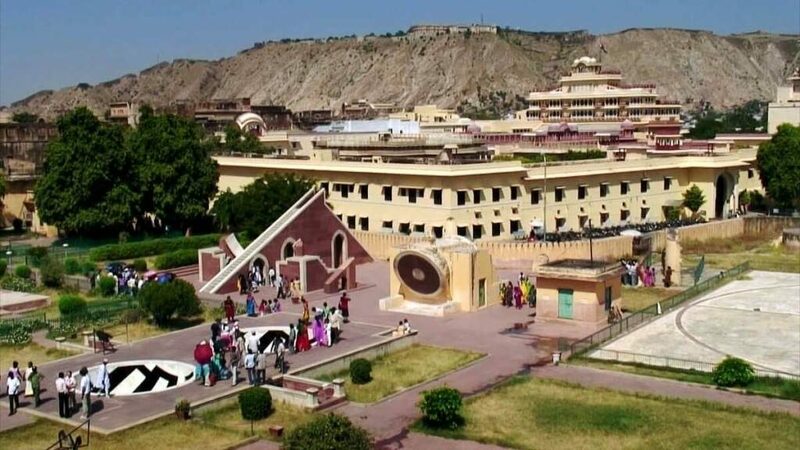 The Jantar Mantar is a faithful reflection of the cosmological conceptions and the astronomical knowledge of the sages that he grouped around an enlightened maharajah who lived at the end of the Mughal era. You can visit Jantar Mantar by travelling through the Palace on Wheels India which is the most famous luxury train in the world. This monumental complex is made up of three different groups of temples built during the heyday of the Chandela dynasty (950-1050). Only about twenty belong to two different religions, Hinduism and Jainism . Its main characteristic is the perfect balance achieved between architectural and sculptural forms. The Kandariya temple is ornamented with a large number of sculptures that figure among the greatest masterpieces of Indian art. Located on an island in the Oman Sea , off the coast of Mumbai (formerly Bombay) , the “city of grottos” is a monumental cave complex characteristic of the Shiva cult . Indian art has achieved here one of its most perfect expressions, especially in the gigantic high reliefs that ornate the main grotto. Located in the city of Mumbai, the Chhatrapati Shivaji railway station called Victoria Station. It is an outstanding example of the mix of neo-Gothic architectural style of the Victorian era with the theme of traditional Indian architecture. This building, designed by the British architect FW Stevens, became the symbol of the main commercial port of India , Mumbai, called by some the “Gothic city”. Its construction, begun in 1878 and completed ten years later, was carried out in accordance with an architectural project of Victorian Gothic style, inspired by the Italian monuments of the late Middle Ages. The eccentric plan of its plant, its stone dome, its turrets and its pointed arches have similarities with the classical palatial architecture of India . Chhatrapati Shivaji is an exceptional example of the encounter between two cultures, as British architects worked with Indian artisans to incorporate indigenous traditions and architectural styles, thus creating a new style, uniquely characteristic of Mumbai. Take a look on the Price of Palace on Wheels train for the leak and peak season.